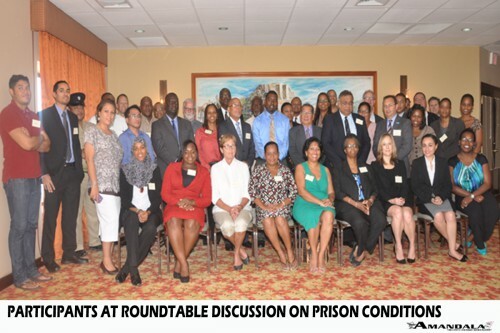 Between 40 and 50 members of the legal profession attended a roundtable discussion on conditions at the Belize Central Prison entitled “Behind The Prison Gates,” that the Bar Association held in partnership with the Death Penalty Project, a London-based NGO that has been working in Belize for the past 20 years. Recently, the Death Penalty Project partnered with Marine Parade Chambers and were instrumental in two murder cases in Belize – the appeal of Lavern “Anti-Christ” Longsworth and the trial of Felicia Chen, whose murder charges were both reduced to manslaughter and were given sentences consistent with the sentencing guidelines for persons whose offences fall within the category of diminished responsibility under the law, due to their mental condition at the time they committed the crime. The roundtable discussion, held on Friday, July 18, 2014, got underway after opening remarks by Eamon Courtenay, SC, President of the Bar Association of Belize; Parvais Jabbar, Co-Executive Director of the Death Penalty Project and Hon. Kenneth Benjamin, Chief Justice of Belize. The highlight of the event centered on a report on the Belize Central Prison that was done on behalf of the Death Penalty Project by Joseph Middleton, a barrister working out of Doughty Street Chambers in the United Kingdom. Middleton visited the prison from July 22 to August 2, 2013, and his 22-page report, which he completed in September 2013, was revised in May 2014. The “Belize Central Prison Project” report was divided into the following six categories: (1) Mentally ill inmates (2) Young offenders (3) The death penalty and death row (4) Inmates serving life sentences (“lifers”) (5) Pretrial delays and excessive remands in custody (6) Manifestly excessive sentences. “There are six inmates at the prison who are detained under the above provisions by reason of insanity or unfitness to stand trial,” said the report. The report describes the condition of a prisoner called “Mr. M,” who has been in prison for 37 years, since 1976, when he was about 20 years-old. “The availability of effective psychiatric care in the prison is inadequate and does not comply with international minimum standards,” the report adds. In regards to young offenders, the report records that, at the time when it was written, there were 80 inmates in the Wagner Youth Facility. Juvenile female prisoners are held in the women’s section of the prison, with other female inmates. “There are two inmates at the prison who are serving life sentences for murder despite having committed their offenses when they were minors,” the report stated.